Welcome to day 28 of 30. I am sure you have been waiting for seemingly forever for this post, as I have been unable to post for the past couple weeks. Strangely, work and family life came first, and finding the time to sit and get my thoughts out while we were in Russia got tougher and tougher each day. So this is indeed “day 28”, it just isn’t sequential days. Sorry for the delay, now let’s get to it! The reason has to do with the method we consider standard for measuring coffee in the specialty industry. If you can’t guess, I am talking about gram weight of the coffee dose. Each of the cups above has exactly 55g of coffee by weight, but between the light roast and the dark roast we have almost double the amount of physical coffee matter. If you were to brew a batch of filter coffee with each of these using the same ratio of coffee to water (let’s say 1:16), you would probably find that the lightest roast is just about right (maybe a little thin), and the darkest is too strong. I’m sure many of you are already thinking you would never brew such a dark coffee as the sample on the left. While these examples are pretty extreme, these variances still exist within “specialty coffee” roasts. They are sometimes just more subtle, though there is no regulation on what is proper roasting so you never really know. This is why it is almost impossible to give blanket advice in the form of “just use a 1:16 ratio and you will get great results!” Even the difference between the middle and right cups, though the color looks very similar, is a significant amount of coffee matter. On the high density side, washed processing, high elevation, cool climate, and varieties like Ethiopian “heirloom” (which is a combination of smaller average size and typically high density) all tend to result in a more dense coffee measurement. When it comes to using density as a measure I want you to consider how much physical space is being used and let it help you with your brewing. There are some other factors at play with density, but I will leave those for another time. 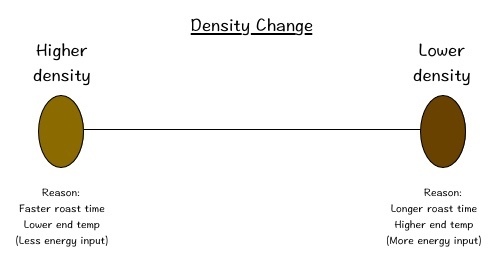 For now let’s look at how to fit our understanding of density into the brewing process. First, let’s start with filter brewing since it is a little more straight forward. These details probably won’t hit you hard in your cafe where the coffee is always sourced and roasted similarly, though it may help you problem solve some coffees such as Brazils or other low density specialty beans. It should definitely impact your bigger picture of the coffee world, where there are countless variations on roasting and sourcing. You simply cannot just pick up any beans around the world, apply the exact same recipe or method, and expect excellent results. Next, let’s talk about espresso. This is where we have a little more impact to the brew. Just like with filter brewing, grind size and the amount of coffee matter directly impact how quickly a shot pours. Unlike filter brewing, just a couple seconds of difference can have a massive impact on the shot’s flavor. Since the standard dose for espresso is considerably smaller, and we have a rather fixed space in which we can brew, variances in the coffee density tend to have much more significant impacts. For example, if a 20g dose is just right with your “medium” roasted coffee, 20g of a darker roast might force the coffee puck against the shower screen as it expands while brewing (which I believe is NOT a good thing).